Today was very reminiscent of the first day of the Melbourne Test in the 2010-11 Ashes, only this time it was England on the receiving end. Amla reached the highest Test score by a South African as he amassed 311* and his partnership with Kallis (182*) was worth 377. 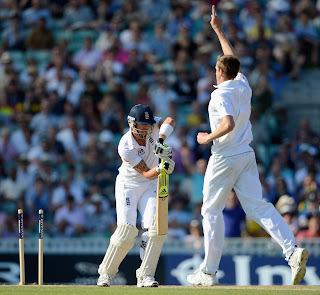 England did not take a wicket, nor looked like taking a wicket, and their painful struggle was epitomised by the round of applause Anderson received for beating Amla's outside edge with an outswinger just after the third new ball was taken. When Smith declared at tea, the score was a scarcely believable 637-2, a lead of 252. England then proceeded to severely reduce any chance they had of saving the game with more irresponsible batting, It took a good ball from Philander to dismiss Cook, but Trott played at a ball he could have left; Pietersen was over-aggressive and then missed a straight ball and Strauss swept wildly at Tahir to present a simple chance to square leg. Suddenly, the pitch looked full of demons, as a ball from Tahir which bounced and turned to such an extent that it nearly hit Strauss in the helmet showed. England ended the day on 102-4 and their fragile hopes lie with Bell, Bopara and the lower order tomorrow.